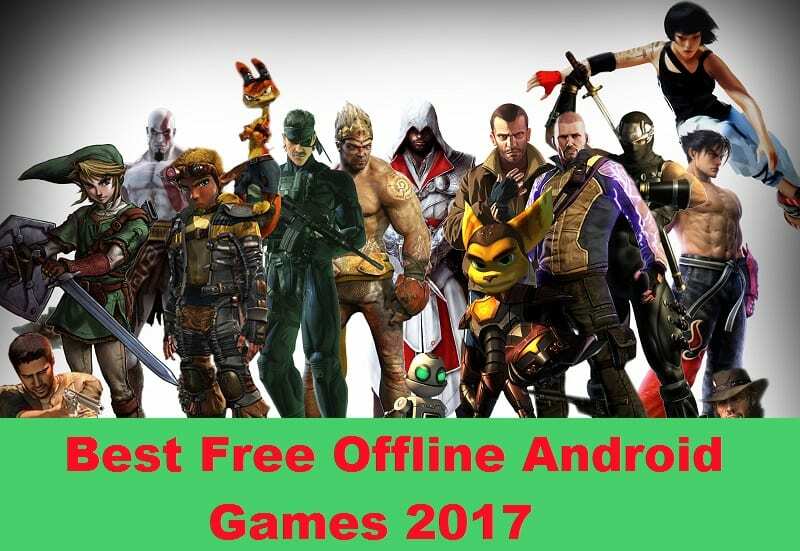 This article contains the best offline games for Android that does not require an Internet connection. BADLAND is a perfect action game. Unique gameplay and thrilling atmosphere make this game compulsory for downloading. The action takes place in the forest which is full of strange dwellers, trees, and flowers. The forest looks so magic as it is taken from a wonderful fairy tale, although something wrong with it. The player is one of the forest dwellers who is gonna to know what happens. Along the way, he discovers a startling number of unique traps and obstacles. Also in the game, a local multiplayer mode is available, in which up to four players can play from one device. The purpose of the multi-user mode is the survival of the fittest player without observing any rules. There is nothing wrong to push your opponent on the rotating disks of circular saws. The app has more than 30 million of downloads. The number of Badland’s players is constantly growing. The app has a lot of awards in recent years. The plot is centered on a factory for the production of everything. You can produce the Rubik’s cubes, car wheel, toys, birdhouses, padlocks and many other things. Welcome to the industrial business, and now you can make a profit at the expense of employees working double tides! So, you are an owner of a fabric and its time to earn money! 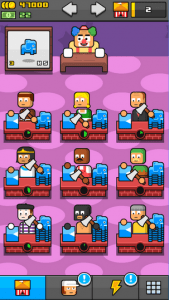 Hire fools-workers, train your employees to work faster, build new factories to produce new cool products, complement all the factories to get mega cool trophies. Each factory has its own peculiarities. One fabric produces cakes and candies, other produces all sorts of agricultural products. Surprises and gifts in the game will enhance your productivity! You make a fortune much faster if the boss will get his cup of coffee! Motivational music will make your employees working monsters! You’re persecuting a single goal – to do more! Make More! for Android gives only positive emotions. Once trying the game you can not stop! The rules of the game are extremely simple: control two dots moving in sync, survive against all odds and keep calm. Your life depends on whether you will be able to save 2 dots, which are synchronized devices coexisting in choreographic and musical symbiosis. You will feel the irresistible excitement. Let the world around you calm down and freeze. In the game, here are several levels (from simple to complex) and 8 parts. You can repeat each step, improving passing difficult moments, and discover more than 25 achievements. The game will help to kill the time when you haven’t got an Internet connection. 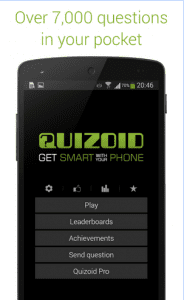 Quizoid contains more than 7 000 trivia questions and 6 levels. Questions are of different categories: Art, Geography, Sports, Language, History, Food, Nature and more… Also, it includes 3 modes to choose from: Classic (an endless play), 20 Questions and Arcade (the time is limited). You are offered 3 lifelines while playing (50/50, 2-shots, change question). The app is regularly updated, so every time you will answer fresh questions. Quizoid can be played anytime, wherever a player is on a long trip or in a sub. Smash Hit is an endless arcade journey into the heart of the abstract world. To get out of it as a winner you only need to throw the ball accurately, and the rest is a matter of technique and patience. However, the game turned to be extremely exciting. In Smash Hit there is no a main hero even. The camera moves forward. It is our eyes in the game world. It currently flies forward, without turning or changing direction. The only task of the player is to destroy the glass obstacles in his path with the help of balls. Although Smash Hit can not be called the top of originality, it is at least a good-quality arcade with the original concept and quality implementation. Smash Hit is a fun gameplay with low complexity and high-quality visual component. A separate advantage is the possibility to play for free in offline mode. Crossy Road is an endless arcade game in which you will need to transfer a character through countless roads, railways and turbulent rivers. All this would be too simple, as all listed places will not be filled with cars, trains, floating logs and other unexpected obstacles. Skip six lanes filled with rushing cars? Jump over the rails, where the train with a dozen of wagons is racing? 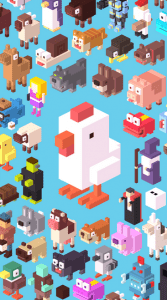 All this is just a routine in the realities of Crossy Road. Each step forward brings you one point. The final result will be announced, when the character dies. Then it all starts again. 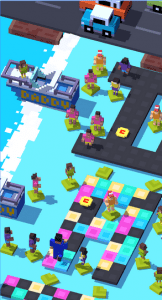 Crossy Road has a nice “cubic” graphics, the same as in Minecraft. 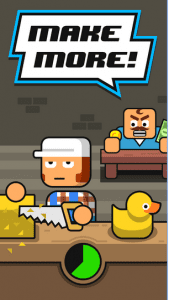 The picture is made in the same funny style as the whole game. It makes you smile. The same goes for sound. Each character has his own melody and all of them are funny. In general, the game gives only positive emotions. Yes, this is another endless arcade game, but created with care. She certainly takes the place of your duty time killer the next couple of weeks. Alto’s Adventure is an ordinary mobile “runner”, but the main character goes forward not on foot but on a snowboard. The boy named Alto pursues llamas which escaped along snowy slopes, and you just click on the screen periodically to make the boy jump. Alto’s Adventure is indescribably beautiful and stylish game. Few runners and mobile games in general, which could compete with it for the quality and conciseness of visual design. And that feeling of freedom and complete delight, which you will feel, admiring the mountain scenery streaking in the background. You generally will not find such game almost anywhere. At the very beginning, the king will send you in a rundown estate that needs to be raised and “put” on feet. 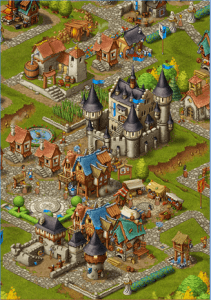 Townsmen is a bright and exciting game for fans of economic strategies. To build a big city from a run-down village around a medieval castle requires a lot of knowledge in economic policy. The city can be made as prosperous as impoverished – all in your hands. Suffice complex manufacturing processes in the difficult economic situation makes the game exciting. The constant variety and complexity of tasks encourage players to play on. The need to constantly use new economic strategies makes the game exciting and extraordinary. The game is designed for people who want to use it to create and develop the world. It can be downloaded to your tablet, phone, or computer. In any case, it has excellent graphics and unlimited game mode that lets you play it all day long. Install it for free and see for yourself. All the boys and even some girls in their childhood dream of becoming masters of martial arts. That’s why we are invited to turn into a war professional in this atmospheric and exciting game. Shadow Fight 2 is made in mixing of two genres: fighting and role-playing games. The goal is to close the gates of the shadow. For this, a player will have to fight with many enemies and evil bosses with demon faces. The whole gameplay will take place as a series of short battles that will last up to two victories. In the battle system it is very similar to Mortal Combat, but the quality of performance, perhaps even better than in this immortal fighting game. A player will be given a bit of money for every victory that can be spent on different equipment. The game is played by millions of people from all over the world. Try it too! Earn to Die 2 at the time of its release became one of the most extraordinary arcades with a rather unusual idea to push the two popular phenomena of the popular culture of our time – powerful cars and the living dead, who are usually called zombies. The game has beautiful and stylish graphics, interesting gameplay and moderately bloody atmosphere. Apparently, this cocktail fell users to taste, as it is played all over the world. Earn to Die 2 takes you into a world filled with horror. Around the zombies and blood, and salvation – only to get to the helicopter, which will take you to a safe place. But not all that bad – you have an armored truck, which is not bad crushes these mindless blood-suckers! It is worth to mention that there is an ability to upgrade your car to run over as many zombies as possible and drive as far as possible until the gasoline end. Get the details from the engine to accessories for crushing zombies! For fans of hard ways, there are 3 levels of difficulty. Punch Quest has all the attributes of classic NES games. The main hero is a jock with a naked torso and his hands in huge gloves. He gives, of course, not the most pleasant hooks and uppercuts. A speed of the action is incredible. The list of enemies is quite expected: dragons, saber-toothed orcs, monks-ninja, flying spheres. It seems that they are from the illustrations of cheap fantasy novels. Fast, bright, interesting, nice sounded and, of course, impossibly pixel game will lodge in the memory of your phone for a long time. And in yours too. Geometry Dash Lite is an entertaining arcade game with colorful worlds in which the hero meets a lot of obstacles. You need to bring your character to the end of the mission no matter what happens. Bright and colorful graphics is full of retro images. 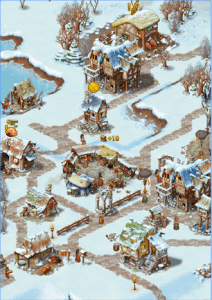 The game has several levels with a consequent increase in of difficulty. In each mission there are geometric shapes of regular shape, all you need to do – is to jump and fly through the obstacles. At first glance, the gameplay may not seem complicated, but the storyline of each task contains certain surprises. The program is very easy to install and does not require any additional parameters. All actions are accompanied by an excellent musical accompaniment, the target audience 3+. Swamp Attack is one of the best arcade time killers on Android. One of the main advantages of the game is that it is free and can be played in offline mode. The game is presented in quite a rare concept of Defence genre. Also, the quality of graphics pleases. Swamp Attack consists of four episodes, which include 78 exciting levels. Of course, with each successive level, the difficulty increases and the game becomes more interesting. At the end of each episode, you will meet with the boss. To win him is the most difficult thing. No matter the time is limited, the game quickly addicts. And the excitement in the fight against monsters is constantly increasing. Prove that you are able to repel anyone who pretends on your possessions. Complete all missions and help the main hero to find peace in the woods, alone with the wildlife. Asphalt8: Airborne is the new part of one of the best arcade racing series on Android. Finally, she is ready to surprise you with new graphics and new features! With the new game engine, the player will get incredible pleasure from the present high-speed stunts and crazy intense races. 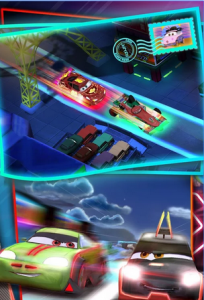 The company Gameloft has collected in the game 47 licensed cars from major manufacturers in the world. The game perfectly realized springboards and incredible jumps on them, as well as maneuvering in the air and flipping 360 degrees. Trails in the game are in the nine most beautiful corners of our planet. So, glad to present you a stunning novelty of the best game developers for the Android platforms, which just in few days became the most downloaded applications on Play Store. 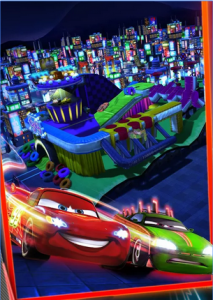 Cars: Fast as Lightning is the races, a parody to the famous cartoon. The game is gorgeous painted and has a very nice gameplay. Unfortunately, the game is not a full-fledged racing but limited to certain swipes at the right time of the track. Although, the game still turned out to be very interesting and exciting. This game sends us into the world of pirate adventures. No more land life. Pirates history revolves around the main character Alonso Batel, who finds the treasure trail of the legendary pirate La Buza and goes to search for new clues as a captain of his own ship with a small team of selected scumbags. Along the way, he will meet many hiding places, treasures, and additional tasks. Great weather effects and changing the time of day, naval battles, the plot, the characters and the system of “pumping” motivate tho pass levels. ZENONIA® 5: Wheel of Destiny is a game in RPG Action style on Android. Once upon a time, there was peace on the land, but over time the greed and selfishness of someone have done their job. The rich began to exploit the poor and the era of chaos began. It was that time when our hero who grew up in poverty and ruin appears. Some of the features of the game are intuitive controls, four types of characters, different skills, PvP battles with real opponents, hundreds of quests. Immerse yourself in the secrets of ZENONIA ® 5! This Android game is a traveling on Wild West where you will meet gang bands and other inhabitants from other worlds. You expect races, cunning witches, and other evil spirits. You will be offered 19 types of weapons, horses and other things to struggle with enemies. 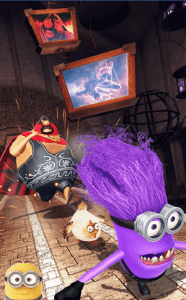 Despicable Me: Minion Rush is a typical runner with highly detailed three-dimensional graphics. In the role of Dave’s minion, we jump through rockets and bombs, collect bananas and power-ups, meet more and more surprising and unexpected obstacles. Dave is aiming to be the fastest and the best one among his fellow minions. Thanks to opponents, the race Minion Rush is full of funny situations. In general, all game is the monotonous jogging through the levels. Only a change of scenery and the fights with the “bosses” are making diversity to a “disgusting” entertainment. Other amusing quests are special tasks for earning extra points. But if there is no desire to bother the player with the passage of such tasks, you can skip paying for that game chips. 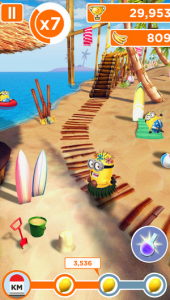 Mini-games also perfectly fit into the gameplay Minion Rush. This is one of the most popular and addictive offline games of 2017. In this crazy adventure, you will meet with incredibly funny zombies and beat them. Gather an army of powerful new plants, charge them with the fertilizer and create a plan to protect your brain. Do regular tasks before the time ends and receive special awards for completing epic quests. The game has been downloaded over 100 million times already. You have a chance to try it too!